Mary is an experienced speaker, educator and consultant and has taught hundreds of women in the classroom, at workshops, and through mentoring. She teaches classes on Sales, Ethics and Integrity in Sales, Social Entrepreneurship, and Customer Intelligence at St Catherine University in St Paul. Mary worked in the corporate sector for several years with Fortune 500 executives negotiating multi-million dollar contracts. As she moved into Higher Education and teaches young women about being a successful sales professional, she uses her years as a successful Sales Leader to provide practical insights about thriving in sales. I help women entrepreneurs like you from a range of backgrounds and experiences. Mary is passionate about working with women who are transitioning from employee to entrepreneur and not sure how to navigate this new world of business ownership. She focuses on Sales fundamentals and a Sales Plan to develop a long-term strategy for growth for the women she works with. In addition to teaching college classes in business, she teaches professional development classes for women in business in the Twin Cities. Check out this #interview we did with Mary Jacobs from The Women's Excelerator and St. Catherine University. We discussed where #entrepreneurs go wrong in sales and why she likes to focus on women. Mary will be back at COCO for another Sales Strategy for Women Entrepreneurs workshop on February 16. You can sign up here: http://bit.ly/2h6RUCn - Grab your seat before it fills up! 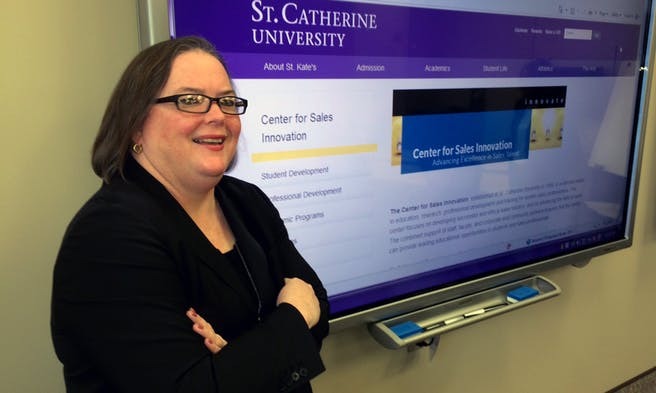 Read this article to learn more about what Mary does at the Center for Sales Innovation at St. Catherine University.